Cystic renal disease is rare in dogs and although infected renal cysts have been reported in humans, no report could be found in dogs. A 58 kg, 5-year-old, castrated, male Boerboel presented with weight loss, pyrexia, lethargy and vomiting, 20 months after an incident of haematuria was reported. 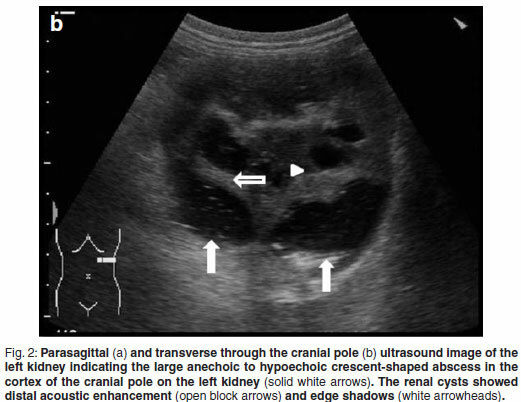 The initial ultrasonographic diagnosis was bilateral multiple renal cysts of unknown aetiology. The cysts had significantly increased in size over the 20-month period and some contained echogenic specks which could be related to infection, normal cellular debris or haemorrhage. In both kidneys the renal contours were distorted (the left more than the right). 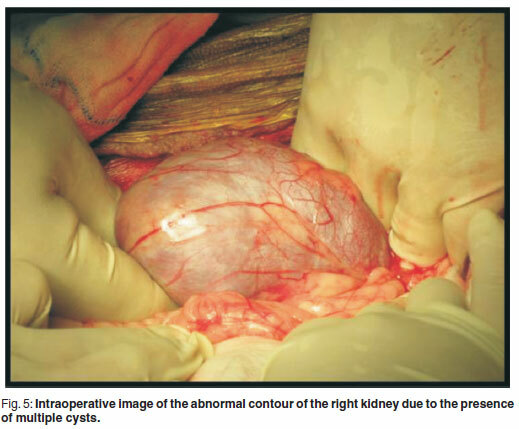 The abnormal shape of the left kidney was largely due to multiple cysts and a large crescent-shaped septate mass on the cranial pole of the kidney. Aspirates of the septate mass were performed (left kidney) and the cytology and culture were indicative of an abscess. It is suggested that the previous incident of haematuria provided a portal of entry for bacteria into the cysts resulting in renal cortical abscess formation. Keywords: abscess, Boerboel, cyst, haematuria, renal. Cystic structures in the kidney can be classified as true cysts (epithelial cell membrane separating them from the surrounding tissue) or pseudocysts (wall consisting of granulation and/or fibrous tissue as a result of inflammation)14,36. Renal cysts can be acquired or congenital, solitary or multiple and involve either one or both kidneys14,19,30,35. Furthermore these cysts can be classified as either simple or complicated, in which case they contain cells, bacteria or fungi34. Renal cysts in dogs, unlike those in cats, are usually small, solitary and incidental14.An autosomal dominant mode of inheritance for polycystic kidney disease (PKD) has been demonstrated in Persian cats6,12, and Bull terriers36. 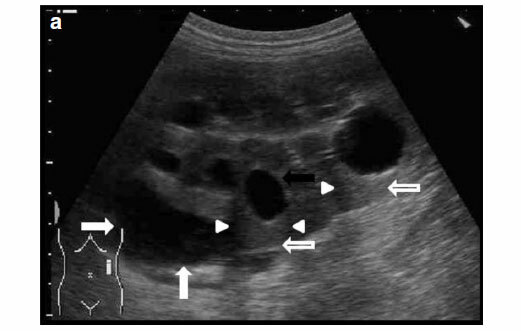 Ultrasonographically simple renal cysts can mimic renal neoplasia and renal cortical and perinephric abscesses in humans11. 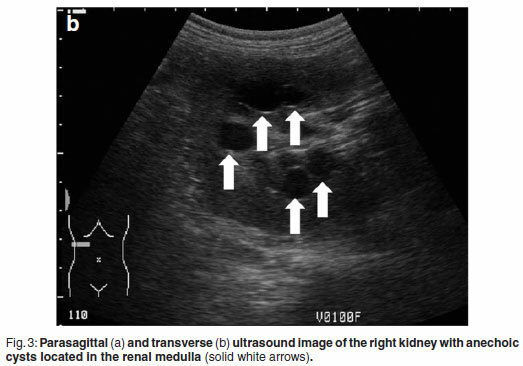 Simple renal cysts usually have a distinct sonographic appearance, which includes a round to oval contour, anechoic contents, smooth walls (with enhancement of the far wall) and marked distal acoustic enhancement6,35. Cysts can have internal echoes that can be related to haemorrhage or cellular debris, or might be artefactual due to a slice thickness artefact mimicking sediment in the cyst14,30,35. In humans complications such as infection and acute rupture of these cysts have been reported3,9,13,15,16,20,23-25,27,29,39-45.To the authors' knowledge, there are no previous case reports that documents renal cyst infection in dogs with multiple-, solitary cystic kidney disease or PKD. A 5-year-old, fawn, fully vaccinated, intact, male Boerboel weighing 58 kg was presented to the Onderstepoort Veterinary Academic Hospital (OVAH). The history suggested a change in the sexual behaviour of the dog with an increased tendency to 'mount' other dogs. Red discoloration of the urine for 2 weeks before presentation was noted. The only abnormalities that were seen on clinical examination were areas of echymoses on the penile mucosa. Faecal analysis was normal. Urine was collected via cystocentesis and analysed with the following findings: urine specific gravity (SG) 1.018, pH 7, proteins 1+, blood/haemoglobin 3+, erythrocytes 2+ and reticuloendothelial cells 1+. Abdominal ultrasound was performed using a Siemens Sonoline Omnia (Siemens AG, Erlangen, Germany) ultrasound machine and a mutli-frequency curvilinear array transducer operated at 5 MHz. This revealed multiple bilateral cystic structures measuring up to 13 mm in the medulla of the kidneys (Fig. 1). The prostate was normal in size with patchy hypo-to anechoic mottled areas. Bilaterally on the cranio-lateral aspect of the prostate there were more anechoic focal fluid accumulations up to 20 mm in diameter. The cytology of the ultrasoundguided fine-needle aspirates (FNA) was consistent with benign prostatic hyperplasia. Owing to financial constraints the owners declined further diagnostics and blood tests. The dog was castrated by the referring veterinarian. The dog was presented to the OVAH 20 months after initial presentation with a history of vomiting of 2 weeks duration. The dog had lost 12 kg and had a temperature of 40.2ºC that was partially responsive to amoxicillin with clavulanic acid (Ranclav, Ranbaxy, South Africa, 625 mg) tablets at a dose of 20 mg/kg tid as prescribed by the referring veterinarian. The rest of the clinical examination was normal as was the faecal analysis. Urine was collected via cystocentesis and revealed the following: SG 1.026, pH 6, proteins 3+, bilirubin 1+, and blood/haemoglobin 4+. Cytological examination of the sediment from the spun down sample of urine revealed 4+ red blood cells. Blood samples were collected via cephalic venipuncture and sent for complete blood count and biochemistry profiles. The results revealed a moderate left shift neutrophilia, mild thrombocytopenia and a mild hyperglobulinaemia. Abdominal ultrasonography was performed under sedation using medetomidine (Domitor, Pfizer, 1 mg/kg) at a dose of 10 µg/kg intravenously. The left kidney measured 10×6×7.5 cm with a slightly uneven margin (cranial pole was larger). A small amount of hypoechoic subcapsular fluid surrounded the kidney. Multiple round, well-marginated, anechoic, cystic structures were seen mainly in the medulla with some extending into the cortex. The largest of these measured 2.5 × 1.5 × 2 cm. These cysts had a clear edge shadow, distal acoustic enhancement with a thin but clear hyperechoic far wall (Fig. 2a,b). Some cysts contained multiple internal hyperechoic specks. The renal cortex was normoechoic and the corticomedullary junction was distinct. 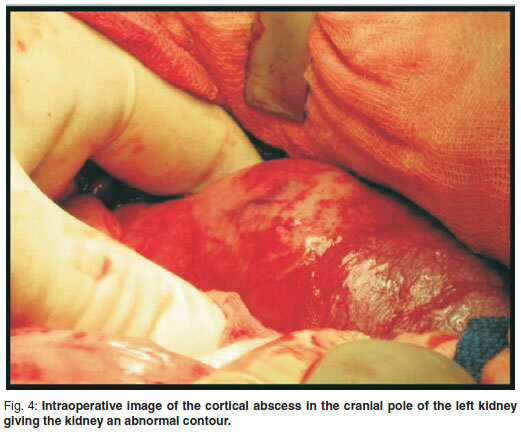 Two of the cranial pole cysts of the kidney were more hypoechoic and communicated with a large 5×3×3cm hypoechoic well-marginated, crescentshaped mass which distorted the cranial pole of the kidney. This structure had hyperechoic septa and multiple hyperechoic internal specks that swirled on ballotment. Acoustic enhancement and edge shadowing were seen. Slice thickness artefact was noted in the mass mimicking sediment. No gas was noted in the mass. The right kidney measured 11 × 6 × 5 cm. Multiple smaller (largest about 1×1×1.5 cm) anechoic structures were present mainly in the medulla (Fig. 3a,b). Some of these cysts communicated with each other and some had multiple hyperechoic internal specks. No cysts were found in any of the other abdominal organs, including the pancreas and the liver. The ultrasonographic diagnosis was atypical multiple renal cysts with a suspected large left renal cranial pole cortical abscess. Other individual complicated cysts could not be excluded. The differential diagnosis for cyst-like structures included uniform blood clots, unclotted blood, abscesses without debris, lymphomatous masses and necrosis related to tumours or cystadenocarcinomas35. 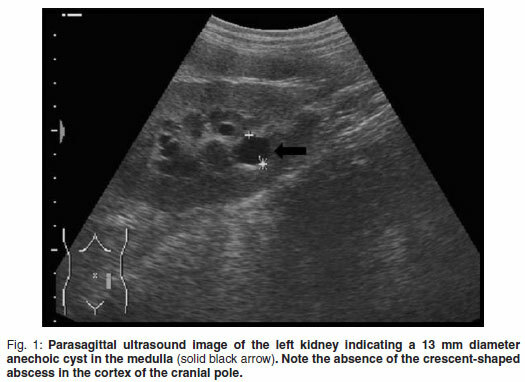 An ultrasound-guided aspirate was taken of the left cranial pole renal mass and appeared to be blood-stained pus, which was confirmed cytologically. Aerobic and anaerobic culture was positive for a rough Escherichia coli sensitive to doxycycline, trimethroprim sulphas, enrofloxacin and chloramphenicol. The patient was treated with oral antibiotics, 5 mg/kg enrofloxacin sid (Baytril 10 % oral solution, Bayer, Germany) but showed no improvement and became azotaemic. As ultrasound-guided percutaneous aspiration of the infected cyst was not feasible due to the size of the dog and the septation, surgical drainage was performed via a ventral midline celiotomy. Macroscopically the left kidney had an undulating shape with a large soft, yellow tinged fluctuant mass on the cranial pole (Fig. 4). The right kidney appeared macroscopically normal except for having an undulating contour (Fig. 5). The area surrounding the left kidney was packed with moist abdominal swabs. During manipulation of the left kidney the abscess ruptured inadvertently and the purulent material was removed by suction. The defect in the kidney was flushed, after which the abdomen was flushed with 10ℓ of lukewarm lactated Ringers solution (Ringers lactate, Fresenius kabi). The abdomen was partially closed leaving the cranialmost part of the incision open for drainage. A sterile non-adherent primary wound dressing and a large amount of cotton wool in the secondary layer for absorption of the exudate were applied. After the drainage the dog was placed on 5 mg/kg enrofloxacin sid (Baytril 10 % oral solution, Bayer, Germany) for a period of 3 weeks. Post-operative pain was treated with 0.2 mg/kg morphine sulphate (Morphine sulphate Fresenius PF, Fresenius Kabi, 10 mg/mℓ) intravenously every 4 hours for the 1st 48 hours. The bandage was changed daily for 7 days in a sterile manner under general anaesthesia, after which the abdomen was closed surgically. During this period the albumin levels were tested daily with a lowest recorded level of 21 g/ℓ (n = 27-35). The dog made a full recovery following surgery and the pyrexia and azotaemia resolved. He was discharged with instructions to complete the antibiotics. The follow-up ultrasound revealed remarkable improvement. There were few residual renal cysts up to 22 mm in diameter, but no evidence of the renal abscess. Polycystic kidney disease has been diagnosed in the Persian cat and English bull terrier, West highland white terrier and Cairn terrier dogs4-7,12,32,33,36,3 and the cysts have been reported to originate from mainly the collecting duct and the distal part of the nephron17. 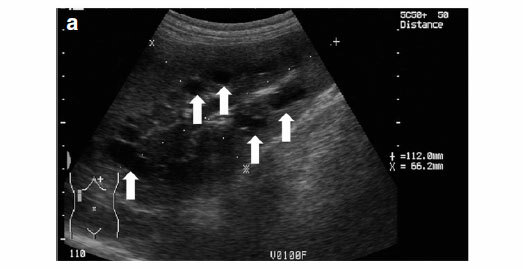 The sensitivity and specificity for the detection of PKD in Persian cats at an age of 3 months using ultrasonography has been shown to be 92.6 % and 91 %, respectively8. Results were 100 % repeatable and disease progression was noted in 75 % of cats over a 1-year period45 but no data could be found for dogs. The disease also progressed in the case reported here with the cysts increasing in size from about 13 mm to 22 mm in diameter over a 2-year period. Although the disease in the current report presented much like PKD, potential cystic renal disease in related dogs was not investigated. Renal abscesses are rare in dogs14,21,46 and their pathophysiology is poorly understood21. The true incidence of renal abscesses is uncertain but 1 study reported it to be 0.003 % of all cases seen over a period of 15 years21. Sonographically specifically be looked for. Depending on the amount of gas, it can present as areas of increased echogenicity with or without dirty acoustic shadowing25 rising to the non-dependent surface of the abscess. Predisposing conditions to renal abscess formation include diabetes mellitus21, nephrolithiasis1,31, surgery2,18, toxin exposure22 and pyelonephritis18.28,31. In humans corticomedullary abscesses form as a result of ascending urinary tract infection, hence the common isolates of E.coli, Klebsiella spp. and Proteus spp.38 Most patients with renal cortical abscesses do not have urinary tract symptoms because the localised process in the cortex does not generally communicate with the excretory passages11. One study reported only 42 % positive renal cultures in humans with renal abscesses10. The authors hypothesise that a traumatic incident might have damaged the cysts and hence contributed to the haematuria. This allowed bacteria to gain access to the cysts with resultant abscess formation. Polycystic kidney disease is a rare condition in dogs. Although infection of renal cysts has been reported extensively in humans, no such reports exist for dogs. This case report presents a large breed dog with slowly progressive multiple cystic kidney disease with focal abscessation of unknown origin. The patient responded well to surgical drainage and antibiotic therapy.